Ancient of Days is not just the band’s third release, but in many ways, a rebirth. It’s Spelljammer’s first recording as a trio — with Olsson taking over bass duties and new drummer Jonatan Rimsbo battering the skins — and the culmination of a progressive move toward a heavier, doom-laden sound, away from the desert rock leanings of their 2010 debut Inches From the Sun. Vol II saw the band spreading out into darker territories. After writing sessions fell apart in 2013 for a followup to Vol II (reissued in early 2015 by RidingEasy Records) Olsson and guitarist Robert Sorling scrapped nearly everything following the departure of half of the band. The two began to build from the ground up as a duo with new ideas that resulted in the invigorated Ancient of Days. It’s the band’s most focused and deliberate in both its complexities and simplicities. 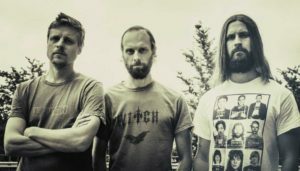 “Having recorded the previous two albums in a more patchwork kind of way,” Olsson says, “we were very set on going into one studio and doing the entire thing.” In so doing, they banged it all out over a weekend in January 2015 at Ingrid Studio in Stockholm, with engineer Christoffer Zakrisson at the helm. Here, syrupy guitars ooze from the speakers, the drums sound like they’re perched atop a giant barge and howling vocals float throughout the proceedings. Ancient of Days very effectively embodies the boundless, otherworldly essence of its inspiration.